Construction of Scott Elementary began in 1949 on what was then called Southwest Elementary. The school opened its doors to students in 1950 with four classrooms and an office. In 1951 two more classrooms were added. Mrs. Fox, the first principal, left Scott after five years to go to Emerson in 1955. Taking the helm in 1955 was Jeff Bentley, Scott’s second principal. That same year a cafeteria, kitchen, and six more classrooms were added. Mr. Bentley later became principal of Travis Middle School. The third principal of Scott was Ace Alsup. He later served as superintendent of Temple ISD. It was during the early 1950’s that Southwest Elementary became Scott Elementary. A group of teachers selected the new name in honor of Dr. A.C. Scott, M.D. Eunice Riley followed Ace Alsup as Scott’s fourth principal. She retired in 1971 at which time Mr. Calvin Whatley was named Scott’s fifth principal, a position he held for 17 years until his retirement in 1988. Pam Johnson followed Mr. Whatley and remained as principal until 1994 when she moved to Jefferson Elementary. Lynn Medley became principal of Scott and served until 2001 when she moved to Kennedy-Powell Elementary. Rosena Malone, Scott’s eighth principal, held the position from 2001 until 2003. Vicky Donohoe served as Scott’s ninth principal in 2003-2004. Marcia Pope served as an interim principal that same year. Melissa Harper served as the 10th principal of Scott Elementary School from 2005-2007 when she moved to Kennedy-Powell Elementary. Donna Lammert served as the 11th principal from 2007-2012. From 2012-2016, Donna Ward was the 12th principal. The current principal is Chrystal Thomas. In 2016, Scott completed the three year process of authorization as an International Baccalaureate campus. 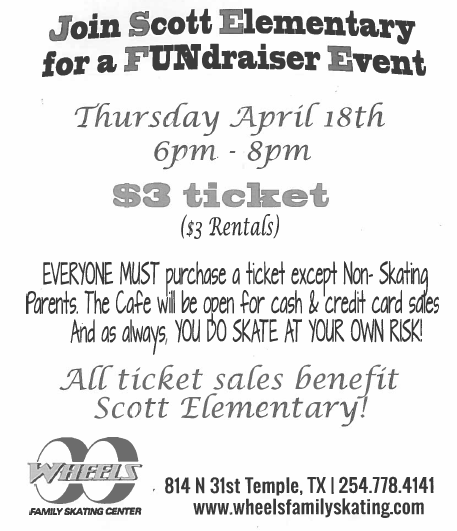 Join us Thursday, April 18th from 6-8 pm at Wheels Family Skating Center! Tickets are $3 and all proceeds to to Scott Elementary PTO. Scott Elementary will be closed to visitors on April 9 & 10 due to STAAR Testing! Click here for more information! Join our fundraiser at Raising Canes on Wednesday, March 27th from 4-10 pm! 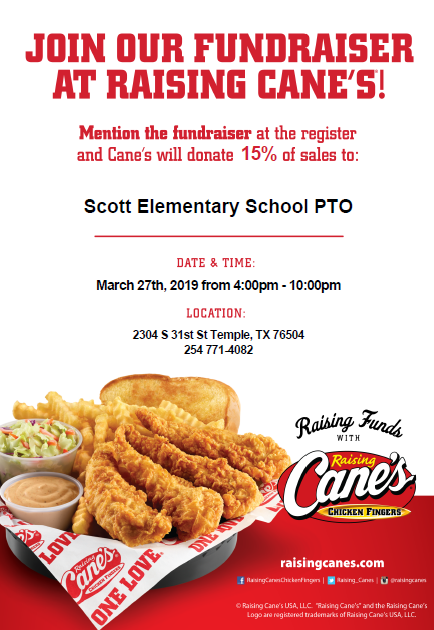 Mention the fundraiser at the register and Cane's will donate 15% of sales to Scott Elementary PTO. STAAR Family Night is Wednesday, March 20th from 5:30-7:00 p.m. We look forward to meeting with our 3-5 families to discuss upcoming STAAR testing! On Thursday, March 7th, students can go to Temple High School from 5:00 pm-7:00 pm for a free make-and-take art night! 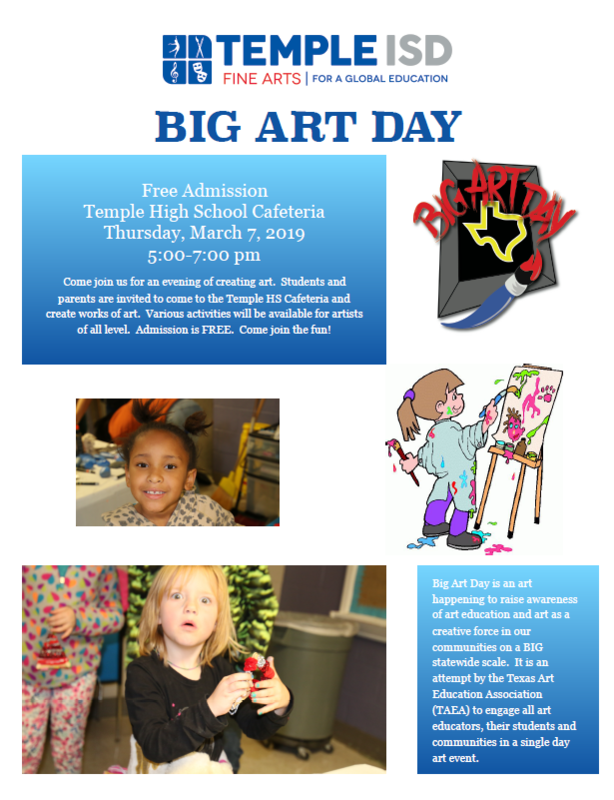 All of the TISD teachers will be hosting a booth where student can create and take home arts and crafts!